Silver and Co are hired to protect a televangelist who has been targeted after publicly saying he was pro-choice. We are introduced to 2 new members of the Wildpack, Crippler and Battlestar. The Wildpack also get new uniforms (thank goodnes for that!!!). Silver runs into the assassin, name of Gattling, who can turn invisible, fly with a jetpack and has 2 huge gattling guns. She also runs into her ex-husband, the mercenary/assassin The Foriegner and he reveals that the Evangelist is in cahoots with a druglord and that that is what eveything is about. The Foriegner kills off another televangelist who is also in the drug trade and Silver and the Wildpack take down Gattling. Silver then turns her client in to the FBI as he was the one who hired the Foriegner to kill off the other televangelist. Ok, several things really stood out with this. First, comic book writers are as preachy, ham-handed and obvious as any social justice warrior today. Christianity, rascism and sexism, all dealt with in this book, with all the finesse of a lumberjack using a sledgehammer to knock a tree down. I don’t have a highly developed sense of tastefulness but this just hurt! Second was the ads. Targeted to the 12-16 age group for sure. The only really good thing about these 2 comics was the expansion of the Wildpack (we see more besides just Sandman and Powell) and the uniform change. We get the addition of Crippler, some badass hydra bounty-hunter to Battlestar, a black Captain America knockoff who is augmented in some way or another. We also see Chen (that is her name I believe) for the first time and we hear some other “names” that I’m sure will be part of the main team. Silver is just an incredibly bitchy jackass. She is also drawn in some of the most outlandish dinnerware styles that are so revealing that I had to roll my eyes. Once again, subtly was not aimed for. The artwork is pretty rough too, with Silver being more identified by her white hair and white/silver outfit (whether dinner dress or battle uniform) than in any uniformity of face or form. This was done quick and dirty and it shows. Silver is testing out a bunch of recruits and only 1 makes the cut. That night she learns that the school where her niece Anna is attending has been taken over by Hydra. Since it is not a paying mission, Silver goes on her own to rescue Anna. Sandman, now apparently a good guy (?) is concerned and puts together a Wildpack team and goes after her. Spiderman is also on the scene and between him, Silver and the Wildpack, Anna is rescued and the Hydra agents taken down. Silver tells off Sandman and docks everyone’s pay and fines them as well. Well, the Spiderman 2099 comics really weren’t working for me, so I decided to try something else. And after Oh My Goddess failed as well, I wanted something I could bail on easily. 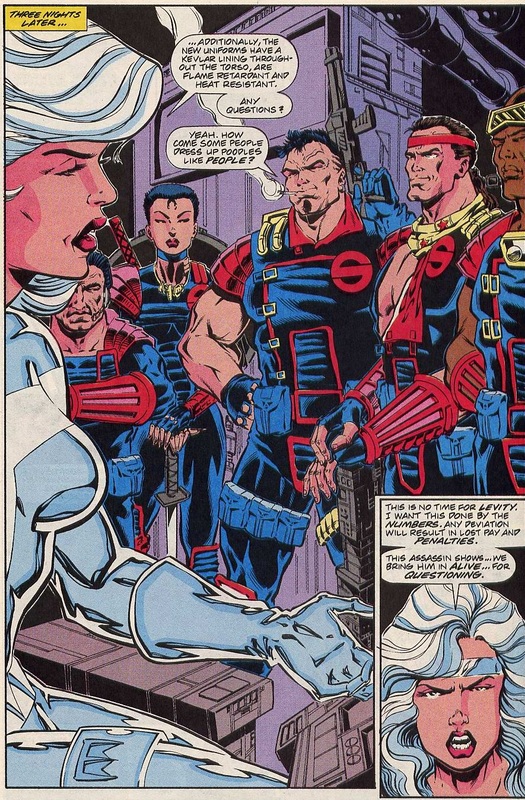 Silver Sable ran for 35 issues, approximately 3 years. She had one or two crossover events with other small time comic characters and like many of the small characters in the 90’s was eventually folded back into a big time character’s book as a side character. I was 14 when I picked this up. I picked it up because it was a Number 1 and comic collecting was really starting to take off. It also didn’t hurt that I was beginning to work and had some money in my pocket. I figured with that shiny cover and being a number 1, that in a couple of years it would be worth so much money. I practically shook my own hand at just how clever I was being. Of course, since you can still buy it for less than the cover price over 25 years later, I guess I wasn’t as clever as I thought. First off, let’s talk quality, eyes, colors etc. This is the very definition of pulp paper. I read one of the copies I own and my goodness, the paper is so rough and yet so thin. The whole book is so thin. It is really easy to forget that these were made as cheaply as possible. The second thing that struck me was just how hard it was to see things. My being 40 might have something to do with that, but the color schemes and the font types, it was meant for maximum wowey zowey’ness, not old eyes. The colors, oh my goodness. Hydra goons were dressed up in bright green and yellow hazmat suits with bug goggles and the Wildpack had purple jumpsuits with orange armor stuff. Garish doesn’t even begin to describe it! Green & Yellow, Purple & Orange? My eyes, MY EYES!!! This was meant to introduce Sable on her own, as previously she’d been a minor character in various Spiderman comics. You get a little about her history and what drives her and are introduced to 2 of the Wildpack, Sandman and the new recruit Powell. For 32 pages, with maybe ¼ of that being ads, this does it’s job of introducing her very well. I don’t have high hopes for this, but really, it’s not meant for that kind of expectation. This was meant for a 14 year old boy.